It's no wonder why we regularly emphasize the importance of using calls-to-action (CTAs) in marketing. CTAs are the gateways to lead generation, propelling prospects through the marketing funnel on the pathway to becoming customers. In fact, we've blogged about how to write CTA copy that gets people clicking , we've shared the sloppiest mistakes marketers make when creating CTAs , and we've even taught readers how to master the design of their CTAs . But among all this valuable CTA-themed content, not once have we shown you how to actually make those CTAs . Shame on us! But in reality, many marketers outsource their CTA design needs, or if their budget allows, hire a designer for their marketing team who can create these pretty buttons to promote their marketing offers. 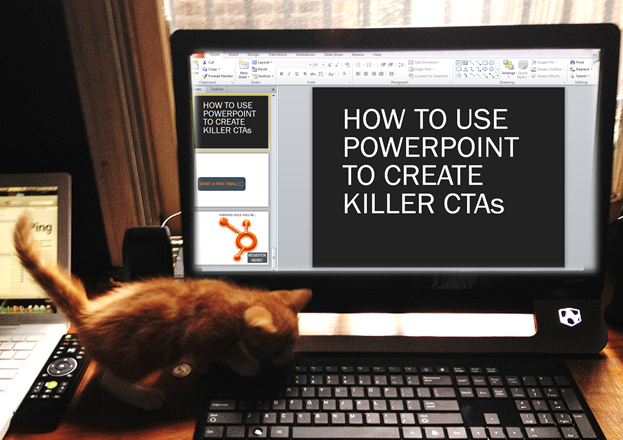 What people don't realize is that Microsoft PowerPoint can be a great tool for a lot of your CTA design needs. 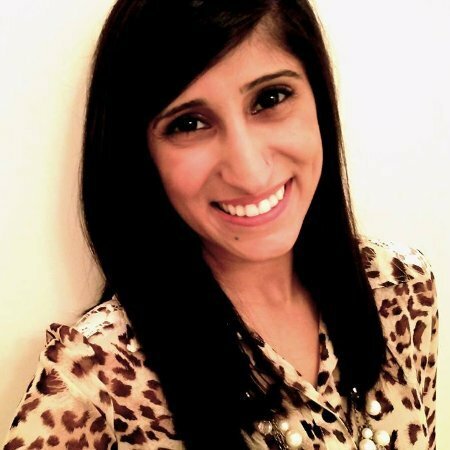 You don't need to allocate a large portion of your budget to CTA creation -- you can just do it yourself! Take it from me; I am by no means any sort of designer, so heck, if I can do it, you can too! It sounds simple, because it is! Decide on a shape for your button, and simply create one on your slide. By double-clicking on the shape, options will appear to change the fill and outline colors of the shape. 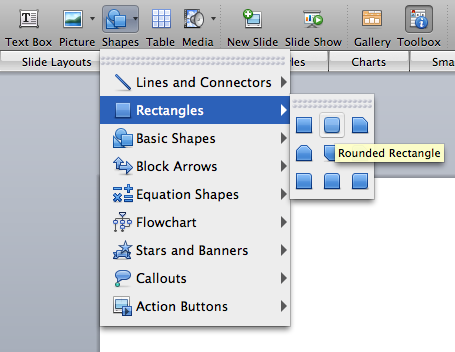 In PowerPoint for Mac, you can also just open the 'Colors, Weights, and Fills' dropdown in the toolbar. This way, you can ensure the colors align with your brand! Simply click 'Insert' --> 'Text Box,' and then click on the shape. This will allow you to create text directly in the text box. Craft a brief message that calls on the viewer to complete the action you want them to do. 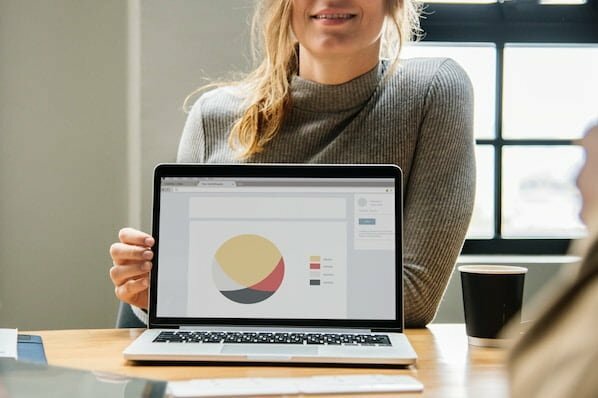 Remember, to adhere to CTA best practices, use actionable words that clearly indicate what the visitor will be doing when click on your button. For example, if our visitor clicked on the button below, they'd expect to be taken to a landing page where they could register for HubSpot's upcoming INBOUND conference . Then adjust the font size to fit the shape as you please. While you can stop at just text, you could also include other shapes in your design to emphasize that the button is a call-to-action, and to indicate action. In this case, I'll add an arrow to the end of the text (which I aligned to the left of the shape in step three), so readers know exactly where to click to go, in this case, to register for INBOUND . Before you save this image, you'll want to group the various pieces of the CTA so they stick together as one. 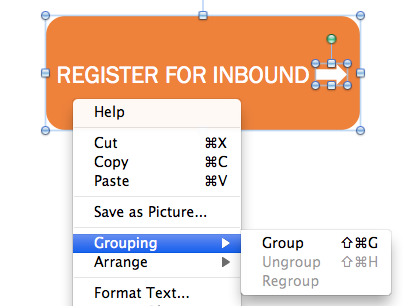 Click on each component, and then right click --> Group . Once all the parts are grouped together, right click on the grouped image as a whole. This time, click the option to "Save as Picture." ( NOTE : If you don't group together each part, your image will not save with all the components of the button). Voila! Your CTA button is now created! Now all you need to do is go to your website, upload the image, and hyperlink it to the landing page you want viewers sent to. And if you're using HubSpot, our easy-to-use Call-to-Action Manager allows you to upload CTA creative and insert them into your content. 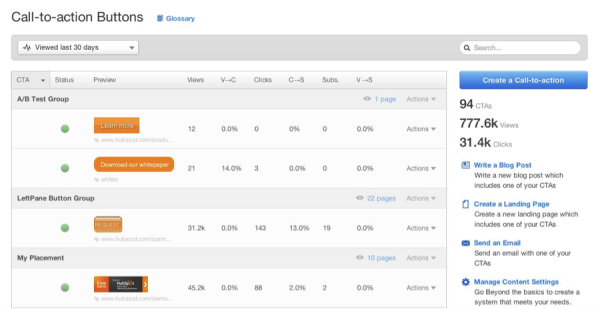 By using the HubSpot tool, you'll also be able to see CTA performance metrics such as click-through rates and number of submissions! If you're interested in branding your CTA or using a custom image, the steps are similar to creating a custom button. But this time, we'll be creating an image that is clearly about your product or service by showcasing your brand logo! 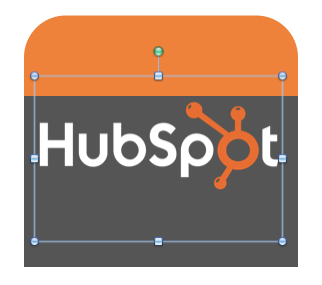 Here's an example using the HubSpot logo. You should already know how to do this now, but if you forget, refer back to Step 1 in the first section of this guide. To add another visual element to your button, consider adding more than one shape to call out different points in the CTA. Below, I made a basic orange shape, and then placed a gray square on top of the bottom two-thirds of the image. You can play around with how you align shapes and colors based on the messaging you're trying to convey. Hopefully you have the original file for your brand's logo. 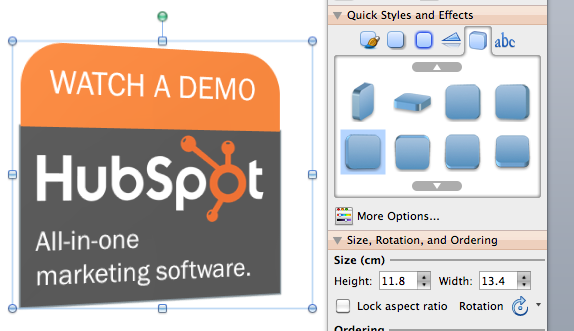 Find that file, and go to Insert --> Image in PowerPoint to place the logo. You can also just copy the file and paste it into the PowerPoint slide. If your image is not transparent, don't panic. 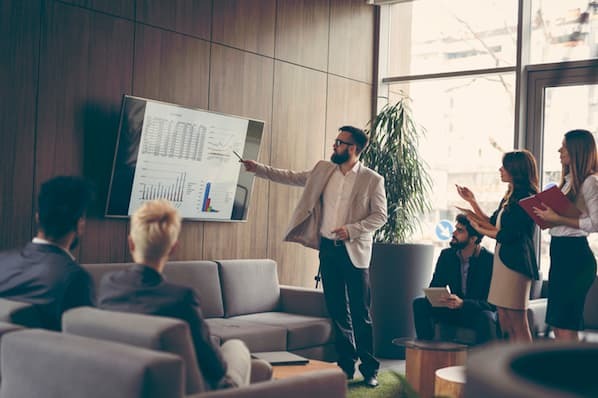 PowerPoint comes with a nifty transparency tool! 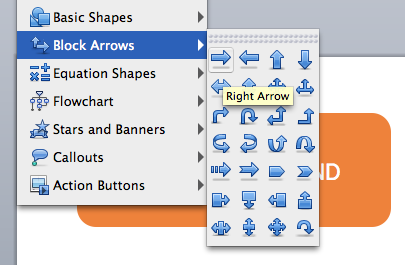 In PowerPoint for Mac, you can find this tool at the top of your toolbar. In PowerPoint for PC, you can find it under 'Effects.' Simply click the tool, and then click on the white background of your image. This should automatically make your image transparent! Next, add the text you want to the rest of you CTA. For this CTA, I'm going to motivate visitors to watch a demo, so I'll clearly type that in the orange portion of the CTA. 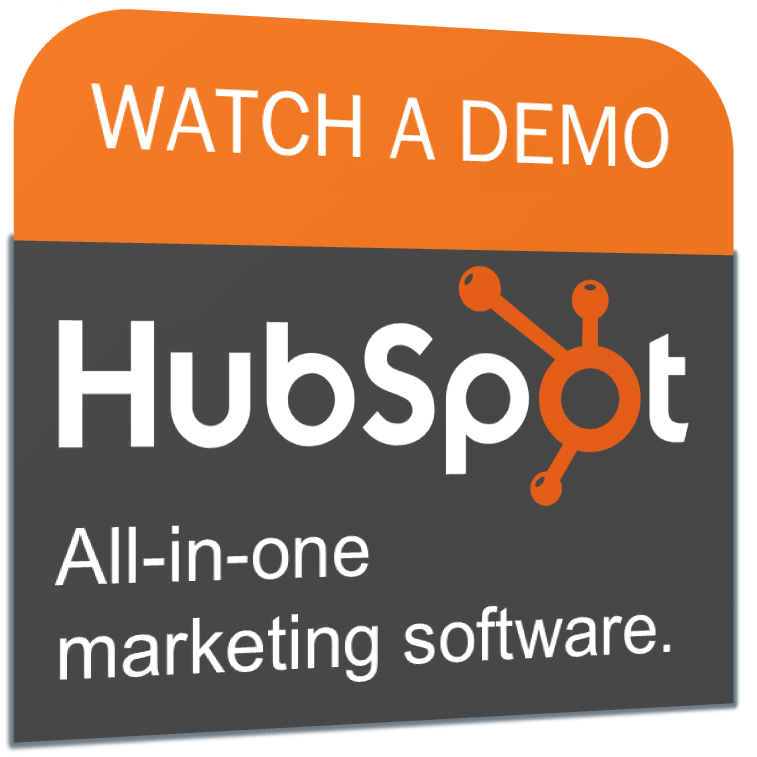 Then under the HubSpot logo, I'm going to add a quick line about what HubSpot is, so viewers know exactly what this product demo will be about. Depending on where you'll be placing this CTA (i.e. on a web page, on a blog post, in a sidebar, within an ebook, in an email, etc. ), you may want to change the way the shape appears. 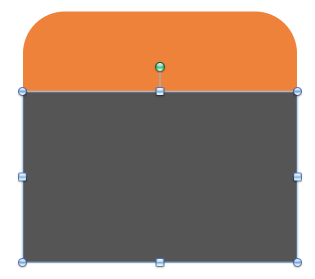 In PowerPoint for Mac, you can simply go to 'Quick Styles and Effects' in the toolbar to change the glow, shadow, or positioning of the CTA. In PowerPoint for PC, double-click on the image, and your top navigation should change to show different effects for your CTA. Step 5: Group and Save! Again, even though only one part of the entire CTA says "WATCH A DEMO," you can still upload and hyperlink the entire image. That way, no matter where visitors click, they'll still end up in the right destination. For this CTA, choose a shape that would easily fit the bottom of a blog post or the desired place on your website. An offer-specific or content-specific CTA usually performs best when it's used on content about a similar topic! For example, in this article, we're blogging about calls-to-action. If you scroll to the very end of this post, do you notice what subject the call-to-action on this post is about? Why -- it's an offer about mastering the design and copy of calls-to-action ! For blog posts, for example, some form of a rectangular shape usually performs best. You'll want a short title in bold letters telling viewers EXACTLY what the offer in your CTA is about. It should grab the viewers attention so they continue on to the next part of the CTA, discussed in step four. Add additional information to give the offer in your CTA some context. In other words, why exactly will the offer benefit the viewer? Why should they click on your CTA? What is your offer's value ? Explain this clearly and concisely. Essentially, you'll be creating a button inside of your button! The point is, even though you'll end up hyperlinking the entire image, viewers may not know they need to click on the CTA to get the offer. They'll either go searching for it or leave because they didn't know what to do. Create another box, perhaps with different colors this time so it stands out from the rest of the CTA, and add clear, actionable text inside of it so visitors know to click. While I hope you found these examples and this tutorial useful, these are merely a few examples of the types of CTAs you can create. Feel free to play around in PowerPoint with the different shapes, colors, and effects and overall options available to you to create different CTAs. And don't be afraid to test multiple variations to optimize the click-through rates of your calls-to-action. Or if you're a HubSpot customer, as we mentioned earlier, you can just rely on HubSpot's handy Call-to-Action Manager to design these CTAs in minutes, upload your own designs, and easily A/B test multiple variations of your CTA buttons. Imagine that! What tools do you use to create your calls-to-action? Have any tips for folks who are just getting started? Share them in the comments!